Posted in Misc and tagged Dun Laoghaire Rathdown, Parking tickets at 10:50 am on June 18, 2018 by Bodger. Dublin City Council successfully introduced clamping in the late 1990s. I have no idea why DLRCC has not done the same. I was wondering about that. In DCC areas if you haven’t paid a previous fine (ie you got the clamp off somehow) doesn’t your car just get towed? So theres no way of racking up massive amounts of fines. What happens in DLRCC when you don’t pay the fine? Nothing? it is one hundy percent because they have lots of rich residents, no doubt the person owing the 15k or whatever, is someone who sees themselves above paying for parking let alone parking fines. probably some banker type dude who is used to the country bending to his whim and playing by their own rules. DCC would not dare anger this person by taking legal action, because theyre a big wheel in the area. If you owe that much they should be able to take your car. All Lombard Street to a China Orange most of the offenders listed have Corps Diplomatique number plates. The Yanks owe the Greater London Authority £10 million in unpaid congestion charges. The do it all the time. A family member worked in a certain posh shop in Grafton street,an African diplomats car, I won’t Say which country, use to park around the back on double yellows while the diplomats wife would shop. Every time it was explained this cant happen its a loading bay/service entrance they were politely told to boo boo off. The government only have the options of asking politely or kicking them out of the country – there’s no happy middle-ground. I fupping hope the Council has initiated proceedings against these people. That’s 2 fines every 3 days. I’d imagine this is owed by a business with a fleet of delivery vehicles or something similar because it would be almost impossible for a single car to be that unlucky. It is not about luck. 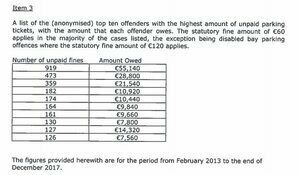 If you park illegally every day all day in a high footfall area you’ll get these kinds of fines. You’d think no body would be that brazen but some are. Just lap a levy on the rest of us. After all the the usual way out of private debt legacy.